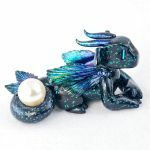 Time to catch up on posting pictures of all the pretty dragons I've made over the past several months. This one was an experiment in using my Solar Color Dust super chameleon flakes on something other than black clay, and I think the results are quite nice. Those green to blue to purple metallic colors are soooo pretty, and they look just like scales. I gave this dragon some leafy green accents and light green rhinestone earrings to match her pale green pearl treasure. I also added a few microbead 'dew drops' on the forehead and shoulders to tie everything together. Crafted from polymer clay, super chameleon flakes, bugle beads, and a Swarovski glass pearl. It's Tuesday night, so I'll be working on dragon commissions on stream from 7-10pm Pacific. As always, you are invited to stop by and say hi over on Twitch. The chameleon flakes add a really nice subtle effect on the coloured clay compared to the eye-catching shine they give the black clay. Really, it draws your eye to how beautiful the base colour is more than anything . Also I really like the leafy accents. All ur dragons so cool! Wow. Your dragons are so cute. (∩ ◕ ‿ ◕ )⊃━☆ﾟ. * It is so cute. I love the colors. I'm so happy to hear it, thank you for letting me know! For Dragons of all Clays!